A big part of the 40k hobby's attraction is being able to inject your futuristic Gothic Sci-fi army with elements from heroic historical forces. We all love reading about the achievements of the 101st Airborne in Normandy or how the Rangers and Delta Force lasted through the meatgrinder in Somalia. Movies like 'Band of Brothers,' 'Black Hawk Down,' and many other sources really do a number on the imagination of the 40k addict propelling him or her towards the idea of building an elite, highly mobile force that has only recently become a legal and affordable option in Warhammer 40,000. The idea of highly trained sophisticatedly equipped troops leaping out of Valkyries en masse to confront a panicked, disorganized foe is a compelling one and today we're going to discuss how to make it a reality. Let's begin with a theme. This part of the army may seem superfluous to some and for many it always will be. For the well-rounded hobbyist, however, an army list begins to take shape only once we have a clear idea of the army's fiction using that as a foundation for how the army will operate on the table. There are, of course, existing regiments that are known to be highly dependent on airborne troops such as the Elysians or Harakoni and there is a certain satisfaction to be gleaned in building a force in accordance to pre-set canon. I chose to blaze my own path with an Inquisitorial Strike Force. My army would represent a Inquisitor's personal army, a hand-picked Ordo Xenos force. The Callidus, disguised by means known only to her shrine and the most clandestine operators, will have infiltrated the heart of the alien host. Having found and neutralized her high-value target, the Callidus will call for extraction and the Inquisitor's Storm Troopers would swoop to the rescue on obsidian wings emblazoned with the Inquisitorial crest. But how to represent this force? Well the idea is to merge the image of the force with a codex-legal army list. The first obstacle the Airborne player will face is the lack of FOC slots for the army to exist in. With only three Fast Attack slots available, how can an entire force be air-mobile? One solution is squadrons. This allows an Imperial Guard player to field up to nine Valkyrie chassis in their army each one capable of carrying up to 12 models. This is not as restrictive as many believe. Squadroning, besides allowing you to inflate the number of Valks available, also lets you allocate hits in ways that can surprise an opponent. In a recent game I had one Vendetta, containing an expensive command squad, surrounded with Ork Boyz determined to glance it to death thus destroying its occupants as well. Instead I allocated all the Immobilized/Destroyed results to the other Vendetta in the squadron leaving the Command Squad's Vendetta only 'Shaken'. Thus I was able to move, disembark from the Vendetta and unleash four flamers on the Ork Mob killing them all, gaining a crucial kill point while giving away none. Despite this small benefit, squadrons are the death toll of any fully airborne army. Your birds will only be able to engage up to three targets a turn, you will live in fear of multi-lasers and scatterlasers whose multiple shots make glancing your Valks to death a common occurrence and maneuvering on a table with large terrain pieces while maintaining coherency is next to impossible. So let's explore some other options. 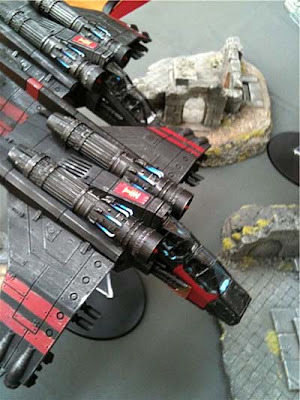 Forgeworld's Imperial Armor Updates allow Inquisitorial Storm Troopers and Inquisitors themselves to take Valkyries (but not Vendettas) as dedicated transports. These squads offer multiple cheap special weapons and Storm Troopers are scoring. It also allows an IG player to gain access to Inquisitorial wargear, such as the Emperor's Tarot, that make airborne forces run a little smoother. The heavily customizable Inquisitorial squads means the player will have greater freedom with regards to what percentage of points are spent on Valkyrie chassis and how many on their contents. For those that don't enjoy including an Inquisitorial element in their army, I recommend talking to your opponent about trading Heavy Support slots for Fast Attack or for the ability to take Valkyries (but not Vendettas) as dedicated transports. Imperial Armor also includes rules for a non-flyer, fast skimmer version of the Vulture. The Vulture is an excellent addition to an airborne force both as a model (very affordable since it became a conversion kit) and as a fire support. I run one as sorely needed anti-horde: four multiple rocket pods and a heavy bolter means great mobility and a great resistance to glancing hits since a 'Weapon Destroyed' result means so little. No one likes 4 big templates dropped on them even if they are "only" Strength 4. You will often find this loadout putting as many as 25 -35 hits on a unit. The twin-linked Punisher cannon is certainly an attractive option as well due to 'cool factor' but don't expect it to do much. One '5' on the Glancing Table will make you cry. Anti-tank duties should not fall to the Vulture as it does not really have the tools to open armored targets reliably. I equip my second vulture with a twin-linked Lascannon and six hunter killer missiles. Deep Strike, 'fast' and the presence of other juicier targets means it can be an effective tank-buster to a degree. The fact that all six missiles and the cannon can be fired at once means it has surprising alpha-strike potential against low-armor high-value targets (rhino full of Death Company). Often I use a Vulture as both a roadblock and as bait. Zoom over and place it in front of that Land Raider full of TH/SS Terminators. The 'dodge' save available to skimmers means the Land Raider will likely have to stay put in the movement phase. If your opponent is foolish, he will assault it with little chance of success and you will have a clear shot at his erstwhile hidden assault unit. Overall Vultures are a great way to fill otherwise useless Heavy Support slots. Some players will object to the inclusion of Imperial Armor rules citing them as "unofficial". For the airborne player, this argument is truly negligible when one considers the "unofficial" limitations the IG player has already levied against himself essentially removing the Heavy Support section entirely. It is a rare opponent indeed who will object to Imperial Armor when the alternative is facing an airborne wing plus an armored column. Still there will be those instances where Imperial Armor is out of the question. What I tend to do in such cases is multi-charge the enemy line with 21 Grey Knights with Furious Charge (from Straken) on the first turn wrecking more or less everyone and everything before the game even begins... aren't official rules great? Go to Part 2, what to include in an Air Cav list. Great Article so far, I can't wait for pt. 2. Great article! Just one thing though - you mentioned that squadrons are great because you can allocate bad rolls on the damage table to less important members of the squadron. In your example, you allocated immobilized/destroyed results to another Vendetta, leaving the shaken result for your command Vendetta. You may have just left this part out of your explanation, but you're actually supposed to allocate glancing and penetrating hits before your opponent rolls on the damage table. So if your squadron of 2 Vendettas takes 4 glancing hits from the Orks you must allocate 2 hits to each Vendetta before you know what the results will be. @Ninjaman: Are you using the IG Codex or the new IA:8? The latter is much more viable for pure AirCav. It was released after I wrote this. @Wilco: Yes, I wasn't clear. I allocated the penetrating hits to one Valkyrie whilst keeping the glancing hits on the Command flyer. Thus I was able to skew the odds in my favor. Not that makes squadrons "great", just manageable. @Atrotos: Ah, that makes much more sense! And yes, it does make squadrons manageable; I run Vyper squadrons in my Eldar list and they often survive longer because I can allocate most penetrating hits to only one of the 2 Vypers. It's also easier to get cover saves since only 50% of one of the 2 vehicles' facings needs to be obscured in order to grant the whole squadron a 4+ cover save. Starken isn't an IC so how can he join 21 Grey Knights, or his ability proximity based? don't have my codex handy... Overall great article and Great Job! Thanks for your feelings on this very interesting topic! Hashshasin: Straken's ability is active in a 12" area. You can attach a Grand Master to the CCS and keep just a couple of models from two Grey Knight Squads within the buffer zone. It's not the mose efficient use of points but no one tends to expect it. As I'm looking at doing something similar, looking forward to the next installment. From reading around it seems IG Air Cav has a mixed reception. How would lists like this perform in tournaments with a 30% Comp score?